Cage culture is an aquaculture production system where fish are held in floating net pens. Cages are widely used in commercial aquaculture overseas and individual cage units come in all shapes and sizes and can be tailored to suit individual farmer's needs. Cages can be used in both freshwater and marine environments. 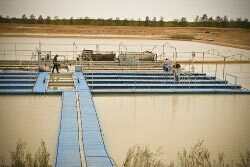 Cages are used to grow Murray Cod in freshwater irrigation dams and abalone offshore in aquaculture fisheries reserves. Species grown in or suitable for cages include Murray cod, trout, Atlantic salmon, kingfish, tuna and abalone. Pond aquaculture is the use of earthen impoundments, with or without drainage infrastructure incorporated, to grow fish and or crustaceans. Ponds are the most widely used structure for commercial aquaculture production. In Victoria, ponds (dams) for aquaculture production are generally static (limited water exchange) and are utilised for yabby culture. 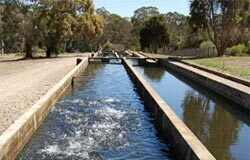 Intensive systems with higher stocking density and feed rates and regular water exchange (irrigation dams or flow-through systems) are utilised to produce Murray cod, trout and salmon. Species grown in ponds include silver perch, golden perch, Murray cod, trout, eel, yabby and goldfish. Recirculating aquaculture systems (RAS) have limited water exchange (typically up to 10% per day) and reuse the culture water. Mechanical and biological water treatment is used to maintain water quality. RAS generally requires less area and water than conventional aquaculture, allows higher stocking densities and provides greater control over the culture environment. RAS may provide a bio-secure environment. Species grown using recirculating aquaculture systems include Murray cod, silver perch, eel, barramundi and golden perch. 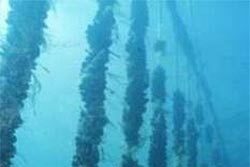 The use of longlines is a key component in marine based aquaculture around the world. Longlines are long ropes anchored to the sea floor at each end and suspended from the water surface with floats and buoys. They are generally used for the culture of shellfish. Shellfish that are cultured in Victoria include mussel attached to droppers suspended from the longline, and abalone suspended from longlines in cages. Submerged longlines are those that are suspended below the surface of the water to avoid wave action. Species grown using longlines include blue mussel and abalone. 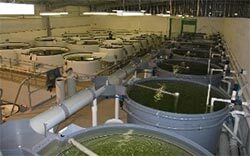 Flow-through systems are generally used for the intensive production of salmonids and for land-based abalone production. 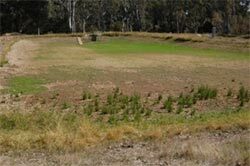 A flow-through system may include earthen ponds, tanks or raceways. They require considerable quantities of water to be pumped or gravity-fed from an adjacent waterway or marine environment, passed through the earthen ponds, tanks or raceways and then discharged back into the source environment with little or no treatment. Species grown using flow-through systems are Murray cod, trout, abalone and Atlantic salmon. 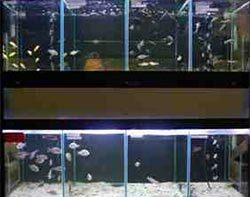 Indoor aquariums are used to culture and breed many ornamental species. Aquariums are a type of recirculating aquaculture system that uses small tanks and treats the water and may provide a high level of control over environmental variables, broodstock tracking and biosecurity.